E&T Plastics is one of the nation’s leading distributors of plastic sheet, rod, tube, and film. E&T Plastics provides manufacturing services for plastic components from concept to production. With eight locations and a multi-million dollar inventory, E&T Plastics is a reliable source for a wide variety of plastic materials and offers custom cutting services, CNC routing, laser cutting, vacuum forming, and traditional plastics fabrication. Our product line includes: acrylic sheet, polycarbonate sheet, ABS sheet, PVC sheet, plexiglass sheet, HDPE sheet, LDPE sheet, UHMW-PE sheet, PETG sheet, Polypropolene sheet, Nylon sheet, PEEK sheet, Styrene sheet, and other plastic sheet materials in sheet, rod, tube, and film forms. 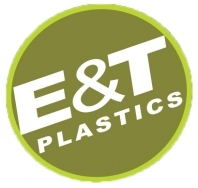 E&T Plastics has been a leading distributor of plastic sheet, plastic rod, plastic tube, and plastic film since 1946.